08 | March | 2011 | WHAT A FEELING! It’s easy to chuckle at the thought of a bunch of Hollywood’s pampered Brat Packers essaying the roles of rough-and-ready cowboys. But the fact is, the stars of Young Guns are probably better suited to pay these roles than many of the actors who have played historical Old West figures through the years. After all, Billy the Kid was only 22 when he died. Many of the upstart gunslingers of the West were brats in their own right. Why shouldn’t they be played by kids? Young Guns, in fact, at least tries to veer near historical truth now and again, as it pertains to the budding career of Billy the Kid. John Fusco’s screenplay picks up young William H. Bonney (played with bright-eyed craziness by Emilio Estevez) as he rolls under the kindly wing of John Tunstall (Terence Stamp), who is raising a hellion troupe of young “regulators.” When Tunstall is murdered, the regulators band together under Billys’ exuberant leadership, and their bloody ride of revenge begins. 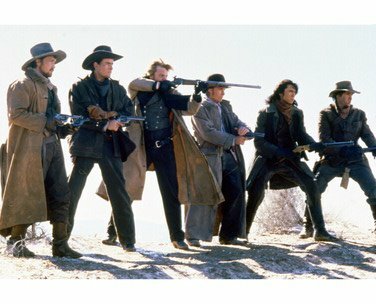 The other young guns—”The flotsam and jetsam of frontier society,” as somebody puts it—are played by Kiefer Sutherland, Lou Diamond Phillips (of La Bamba), Dermot Mulroney, Casey Siemaszko, and Charlie Sheen (in real life, Estevez’s brother, and by now a bigger star). They go through some reasonably familiar formula paces, which means the movie has a cardboard quality but also has a few good old-fashioned moments. The view of Billy as a fun-lovin’ psycho is not especially new, though Estevez does play the role as an almost modern-day character, not too far from his anti-establishment smarty-pants in Repo Man. Sutherland’s cowboy poet leads the movie into its ickiest sections, as he falls for a Chinese girl and begs her to run away with him. Elsewhere, though, director Christopher Cain does capture some of the unpredictable violence and fever of the youthful desperadoes. A scene in which Billy flies off the handle and blows away some captured bad guys catches the hair-trigger violence of the character, and a later scene in which he deliberately disarms a would-be bounty hunter in a bordello taps into some wicked black humor. And he nods toward the traditional Western with the casting of Jack Palance, the all-time evil hired gun of Shane, to play a similarly despicable villain here, plus a cameo by Patrick Wayne, John Wayne’s son, who plays Pat Garrett. Wayne’s presence is a nice link to the Western of old, though it can’t help suggesting the likelihood that the Duke could’ve mowed these whippersnappers down before supper. This sounds a little generous to me now; I remember when Young Guns II came along, I thought it was a distinct improvement, in part because of the energy boost supplied by the New Zealander at the directing reins, Geoff Murphy. But if every era gets the Billy the Kid it deserves, then Young Guns can accurately be said to represent the late 1980s. You are currently browsing the WHAT A FEELING! blog archives for the day Tuesday, March 8th, 2011.